The Nieuwland catalyst is a mixture of copper(I) chloride and potassium chloride or ammonium chloride in water used together with acetylene to form a mixture of vinylacetylene and divinylacetylene. 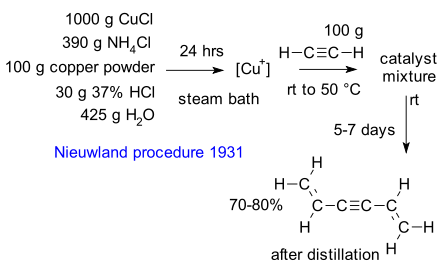 This reaction was first reported in 1931 by organic chemist / botanist / Catholic priest Julius Nieuwland (DOI). Vinylacetylene paved the way for the development of the first synthetic rubber neoprene through its hydrochloric acid adduct chloroprene. The purpose of potassium chloride is to allow the concentration of the copper salt to be increased. The reaction mechanism has recently been re investigated (Tachiyama et al. DOI). In it, copper first forms a copper - acetylene pi complex and then an organocopper sigma complex with expulsion of a proton. This step is the rate-determining step as evidenced by a 4.7 kinetic isotope efect. 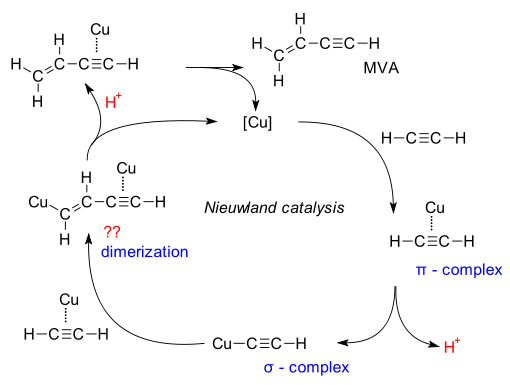 This complex and another pi complex then dimerize in a step that still needs elucidation. Sigma complexes of copper with acetylene can also be found in the Sonogashira coupling and the Cadiot-Chodkiewicz coupling.